There's no better way to show your father you adore him this Father's Day than by giving him a pasture-raised Canterbury Angus T-Bone Steak (450g). I cannot speak for other fathers, but I'd love nothing more than receiving the most prized cut of beef for Father's Day, maybe I'm just too much of a caveman :). 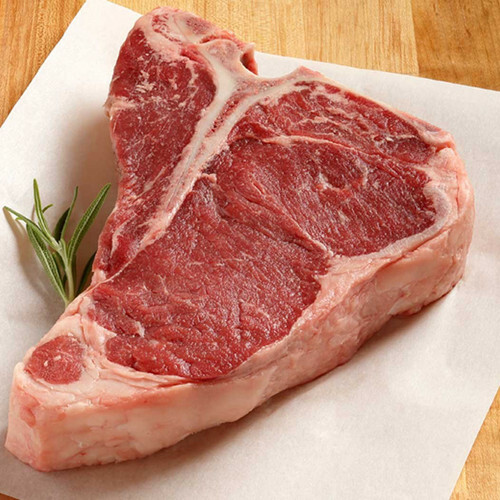 Steak is ideal for fathers, our Canterbury Angus T-Bone Steak has a strong b-vitamin profile (B1, B2, B3, B6 & B12) which aids in cell nourishment. As we all get older our stomach releases fewer acid secretions which makes its tougher for our bodies to absorb B vitamins from food, eating foods high in B vitamins is a great way to counteract that (links to study in footer). Asides from the health benefits, what makes the T-bone prized is that it is formed of two different steaks, one part sirloin, one part tenderloin. Two distinct textures and flavours in a single steak weighing in at 450g. Pasture-raised from Canterbury, New Zealand, no growth hormones, no antibiotics, no corn or soy used. If you spend 3,500฿ or more and use the voucher FathersDay you can receive a complimentary Canterbury Angus T-Bone Steak worth 595฿ for Father's Day.